^ E.O.Wilson (ed. ), F.M. Peter (associate ed. ), Biodiversity, National Academy Press, 1988. ISBN 0-309-03783-2; ISBN 0-309-03739-5. ^ R.H. Whittaker, "Evolution and measurement of species diversity", Taxon, 21, pp. 213-251 (1972). ^ N. Myers, "Threatened biotas: 'hot spots' in tropical forests", Environmentalist, 8, pp. 187-208 (1988). ^ N. Myers, "The biodiversity challenge: expanded hot-spots analysis", Environmentalist, 10, pp. 243-256 (1990). 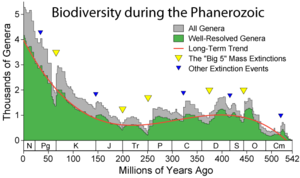 ^ J. Alroy et al., "Effect of sampling stanardization on estimates of Phanerozonic marine diversification", Proceedings of the National Academy of Science of the United States of America, 98, pp. 6261-6266 (2001). ^ S.L. Pimm, G.J. Russell, J.L. Gittleman, T.M. Brooks, "The Future of Biodiversity", Science, 269, pp. 347-350 (1995). ^ P. Ehrlich, Extinction, Random House, New York (1981). ISBN 0-394-51312-6. ^ Iguchi, Y. (2009) Biodiversity and. Conservation, 18: 2119-2126. ^ S. Nee, "More than meets the eye",Nature, 429, pp. 804-805 (2004).